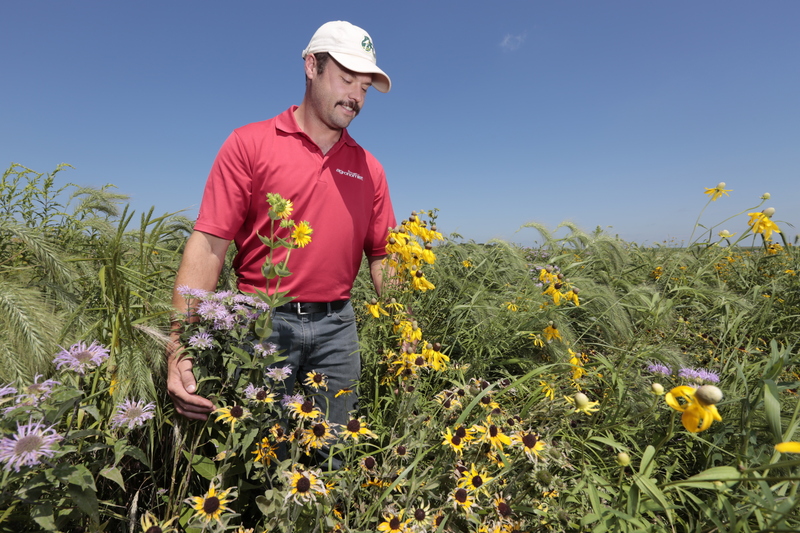 AMES, Iowa — An Iowa State University research project has found that prairies, known for an abundance of deep roots, don’t interfere with tile systems running under them. Perforated tile are buried under cropland to remove excess water detrimental to crop production. Farmers and landowners considering installing strips of prairie plants in their fields have asked about the possibility of roots growing into tile lines, said Tim Youngquist, an agricultural specialist and farmer liaison for Iowa State’s Science-based Trials of Rowcrops Integrated with Prairie Strips, known as STRIPS. “We do see some slight root penetration into the tile line, but it’s quite minimal overall,” he said of the survey, which was done in August. The largest root encountered was from a cottonwood tree sapling, which was growing in the prairie. Helmers, who also holds a Dean's Professorship in the College of Agriculture and Life Sciences, said managing woody plants is important to avoid their roots encroaching into tile. When compared to the view of tile under a field of continuous corn, Helmers said there were similar or more roots from the corn. In either case, he added there wasn’t enough root growth in these tiles, which were installed in 2008, to plug the tiles or interfere with drainage. Sometimes farmers report finding a tile plugged with herbaceous roots in low-lying areas or along stream corridors. The usual cause is reed canary grass, an aggressive non-native plant naturalized in the Iowa landscape that is not seeded in prairie plantings.